I tried everything went through different forums but still I can only watch 4k videos wih 720 on my note 4 ! Please help - would be great !!! I just side loaded the newest version of YouTube, and it is now giving me the option of 1440p in the quality settings. Would you please list the steps you took to achieve this? I found this solution on XDA and followed the steps precisely, but I can only get 1440p on the desktop version. Thanks in advance! This is not like the xda thing. It's the newest version of YouTube, ver. 6.0.1. It will be in the playstore eventually. I just didn't feel like waiting. You just need to find a reputable sight with a link to the apk download, download the file and install it, and you should be good to go. Try the note 4 camera mod. Just Google it and you'll find one, it's by a guy called Kevin rockman. You might try clearing the cache for YouTube. I got 1440p as soon as I installed the apk. Sorry to hear that it's not consistent. Did you get the update from the playstore, or did you side load it from one of the links? I downloaded mine from a link that was posted by the Android Police site. Perhaps there's a difference in the apk file. That is really weird. I don't understand how I can get 1440p, someone else gets 1080P, and you get 720p,all supposedly off the same apk file. I do know that I'm not going to take any more updates to YouTube, because most likely the 1440p option will disappear. Can you post a link to the site where you downloaded the you tube app from? I don't think they'll let me until I have 10 posts, but if you go to the Android Police site, and look for the story on the new YouTube update, the link will be there at the bottom of the story. Downloaded the apk from the android police article and still no 1440 option. I give up. One more observation, and then I'm going to let this go. My son has an identical note 4, and we're both on t-mobile. I transferred the same apk file that I used to his phone, and installed YouTube from that file. The most he can get is 720p, while I'm still getting 1440p. 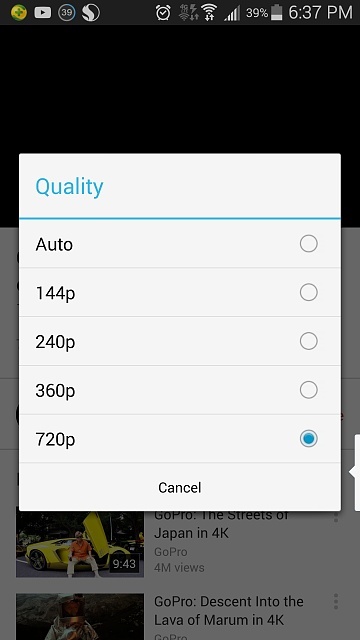 I really don't understand why some phones can get 1440p, while others cannot. Maybe someone on this forum who is alot smarter can figure it out, but it has me stumped, so I'll just be grateful for what I have, and let this thread go. I too have the new YouTube app sideloaded but only get the 720P option. I've cleared cache, even removed the previous updates but still the same. Only 720P. How did you guys manage to get higher resolutions? I'm gonna jump in here - I don't have the Note4, I have the LG G3. Yesterday I sideloaded YouTube 6.0.11, before that I was on the latest from the Play Store. (v 5.17.6). On 5.17.6 I was only able to play videos at a max resolution of 1080p, even videos that were shot in 4k. And just in case: Remember, it doesn't matter if your phone can play 4k video when the video you're trying to watch is only uploaded in 720. I may be stating the obvious here and I probably am. I figure it's worth pointing out anyway - if I upload a video in 720p, that's the max resolution anyone will be able to watch it at, no matter what. Full stop. BUT the apk in the link DID allow me to finally watch 4k videos at full resolution, whereas before I would max out at 1080p, no matter what. Finally got mine working, cleared cache, Uninstalled all updates, and turned the app off. Then I restarted the phone and installed the apk. If you can't get it to work try this option. Some people need to understand just because a device does video at 4K res doesn't mean you can watch it back on it in 4K res. You need a proper 4K tv or monitor to get all those pixels. As far as YouTube goes they don't want everyone watching videos in native 4K res it would eat up their bandwidth as well as yours sending all that data. Ah yeah I miss read this thread .... It's a YouTube thing not a Samsung thing as to the resolution allowed when on YouTube. I tried all that too and still only displaying the 720p option. Since I've reset factory settings, why ins't my Android Tablet launching the apps screen? Can a LG VS980 w/no sim card be unlocked?